Tonight we had returning guest psychic and colour expert Pamala Oslie, who was missing as we began the show. Kat spoke about her Wednesday speaking engagement at the Rockland Memorial Library. I spoke about seeing the new film The Forest while we waited to get ahold of Pamala. Henry was able to get Pamala online, and we kicked off speaking about her Infinite You book. As Pamala touched on the aspect of quantum physics, and the concept of observation changing outcomes, I pointed out the Doctor Who episode Blink. Henry announced we'd be doing a live show from Gettysburg in April, possibly from the Dave Stewart Farm site, which was a hospital for the wounded during the war between the states. Pamala discussed alternate universes, and overlapping dimensions, as well as positive perceptions about one's own reality. Henry suggested to the chat room, they go to Pam's Aura Colors and Love Colors sites, at which visitors can take the colour test, for readings after the break, or at least understand the colour references. Ceiling Cat Barbara Duncan reported our having listeners tonight in the US, the UK, Canada, Belguim, Germany, Norway, Costa Rica, and the Philippines. Henry asked about reincarnation, about which Pamala analogized as being similar to doing stage plays, as well as obliquely referencing my favourite quantum physics book, The Holographic Universe by Michael Talbot. As listeners were checking out the online test, Pamala provided what colours represented what. As the show wound down, I gave out Pamela's Aura Colors and Life Color City websites, and didn't quite re-find the info regarding her weekly radio show which airs live Mondays at 5pm-6pm pacific, 8pm-9pm eastern, and that it has archived podcasts. Pamala has two Twitter accounts, @PamOslie and @auracolors, and she's on Facebook, as is her Life Colors book. I also quickly provided my website's Paranormal View hub page one can find the show's respective report pages, that we're very findable on Facebook, page, though I had no time to indicate one can Follow me on Twitter. Henry conveyed our having Amelia Cotter returning as our guest the next week, discussing her Maryland Ghosts book. Kat pretty much only gave out her JinxedComic.com site, as opposed to her Kat Klockow website, though not so much her Hunt For Ghosts site. 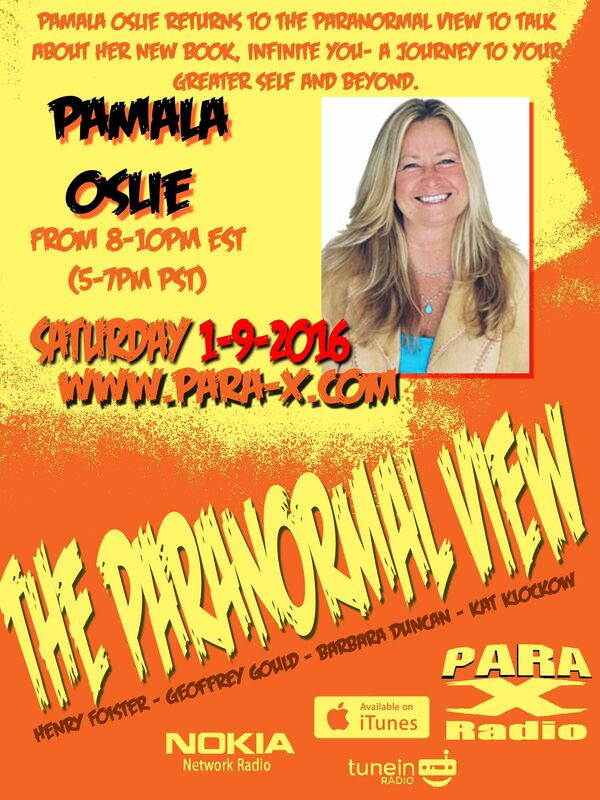 Pamala Oslie: 09 January 2016 edition guest on The Paranormal View.